Brain tumors do not discriminate. 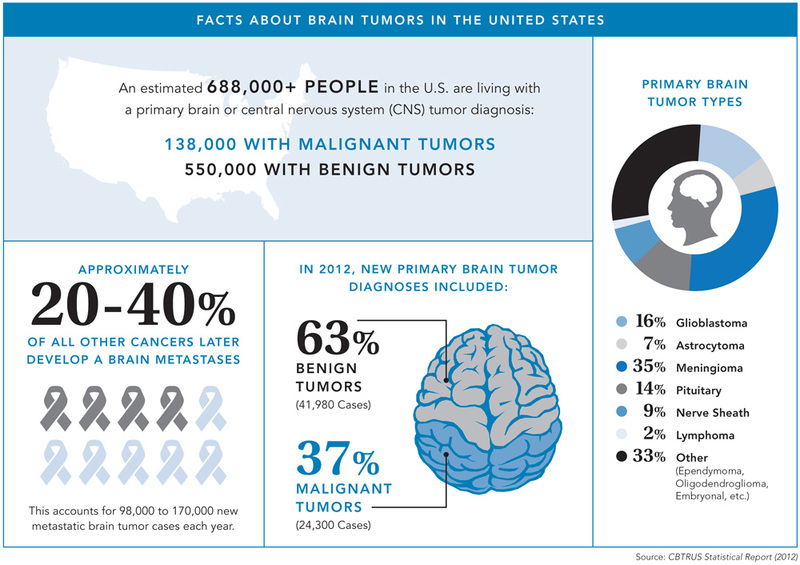 Primary brain tumors – those that begin in the brain and tend to stay in the brain – occur in people of all ages, but they are statistically more frequent in children and older adults. Metastatic brain tumors – those that begin as a cancer elsewhere in the body and spread to the brain – are more common in adults than children. These numbers address incidence, trends and patterns in the United States only. The facts and statistics include brain and central nervous system tumors (i.e., spinal cord, pituitary and pineal gland tumors). We continually update these statistics, as they become available. This information was last updated in January 2017. We thank the Central Brain Tumor Registry of the United States (CBTRUS) for their assistance. These numbers address incidence, trends and patterns in the United States only. For more information, please visit CBTRUS at www.cbtrus.org. Nearly 80,000 new cases of primary brain tumors are expected to be diagnosed this year. Approximately one-third or 32% of brain and CNS tumors are malignant. This includes more than 26,000 primary malignant and 53,000 non-malignant brain tumors. There are nearly 700,000 people in the U.S. living with a primary brain and central nervous system tumor. This year, nearly 17,000 people will lose their battle with a primary malignant and central nervous system brain tumor. Survival after diagnosis with a primary brain tumor varies significantly by age, histology, molecular markers and tumor behavior. There are more than 100 histologically distinct types of primary brain and central nervous system tumors. The median age at diagnosis for all primary brain tumors is 59 years. Brain tumors are the most common cancer occurring among those age 0-14, and the leading cause of cancer-related deaths in children (males and females) age 0-14, according to a 2016 report that places brain tumors in children above leukemia for both statistics. It is estimated that more than 4,800 children and adolescents between the ages of 0-19 will be diagnosed with a primary brain tumor this year. Brain and CNS tumors are the third most common cancer occurring among adolescents and young adults (ages 15-39) and the third most common cause of cancer death in this age group. Meningioma represents 36.6% of all primary brain tumors, making them the most common primary brain tumor. There will be an estimated 27,110 new cases in 2017. Gliomas, a broad term which includes all tumors arising from the gluey or supportive tissue of the brain, represent 24.7% of all primary brain tumors and 74.6% of all malignant tumors. Glioblastoma represent 14.9% of all primary brain tumors, and 55.4% of all gliomas. Glioblastoma has the highest number of cases of all malignant tumors, with an estimated 12,390 new cases predicted in 2017. Astrocytomas, including glioblastoma, represent approximately 75% of all gliomas. Nerve sheath tumors (such as acoustic neuromas) represent about 8.2% of all primary brain tumors. Pituitary tumors represent nearly 16% of all primary brain tumors and rarely become malignant. There will be an estimated 14,230 new cases of pituitary tumors in 2017. Lymphomas represent 2% of all primary brain tumors. Oligodendrogliomas represent nearly 2% of all primary brain tumors. Medulloblastoma embryonal/primitive tumors represent 1% of all primary brain tumors. The most common site for primary brain and CNS tumors (37%) is within the meninges. If you are a patient, a caregiver, or a friend and are interested in the services our foundation provides, please call (619) 515-9908 or email us at info@sdbtf.org and we would be happy to assist you. You can also write us on our contact page. If you are interested in donating to the San Diego Brain Tumor Foundation (SDBTF) you can DONATE via PayPal or you can send a check to 852 5th Ave, San Diego, CA 92101. All funds go directly back to patient services. Send us your contact information and we will keep you updated with all our news and upcoming events! © 2018 San Diego Brain Tumor Foundation. 852 5th Avenue San Diego, CA 92101. The San Diego Brain Tumor Foundation is a 501(c)(3) tax exempt, nonprofit charitable foundation. Tax Id # 30-0125828.